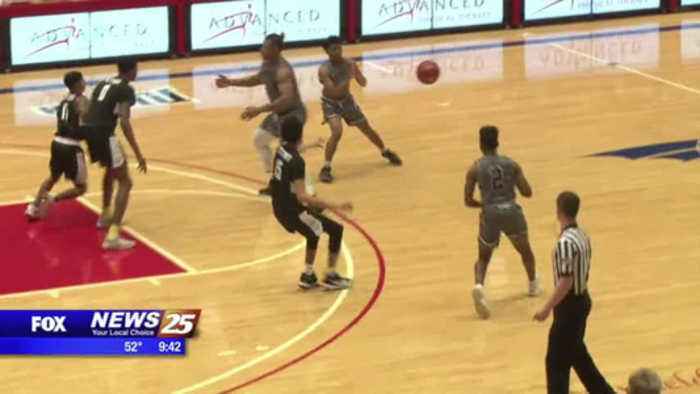 After winning its first ever Region 23 Tournament title, the Pearl River Community College men’s basketball program is making good on its first ever trip to the NJCAA Tournament. - after winning its first-ever- region 23 tournament- title... the pearl river- community college men's - basketball- program is making good... on it- first-ever trip... to the n-j-- c-double-a tournament.- let's head to hutchinson, - kansas... 11-seed wildcats one- of- 24 teams gunning for a national- title... taking on 22-seed- williston - state... winner advancing to th- sweet 16. - and maybe some first-half - nerves, for p-r-c-c... down 20-- after just six minutes of - play... and here's another look- at- - - - the block on cedric brim junior- but brim and the wildcats would- have the last laugh... blocked- again down low... but - christopher agbo... one man's - trash... another- man's treasure... that ties the- game at 51 a piece... and pearl- river would roll from there...- pulling away late, 83-69... cat- will play 6-seed odessa, at 8 - p-m tomorrow... in a sweet 16 - match-- up.